This is a really exciting time right now. 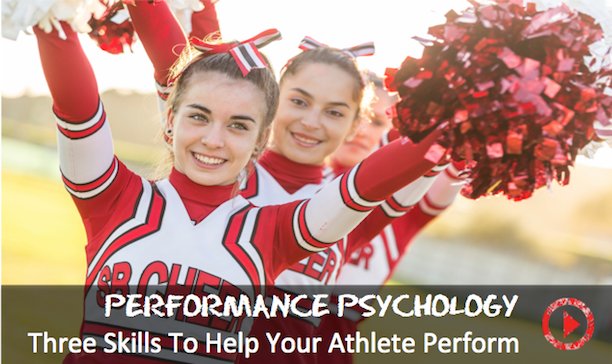 In the world of elite performance, we've spent a lot of time understanding how to cultivate an ideal performance from a body standpoint, from a physical standpoint, and the science of that is really rich. And now we're pushing into a new frontier which is to really understanding how our minds work, how the psychology of elite performance is a really important factor. And the challenge is that it's invisible. So it's taken us time to understand how to understand it and how to cultivate it and how to train it. There's very specific skills that we can work on. Having a vision. Having a really clear vision of where we want to go in our own lives and where we're taking our efforts. That's important. Write it down. Spending time to articulate that so that we can share it clearly with ourselves and with other people. The second part of having a vision is having some goals, some milestones that are in place. Some markers if you will about for how we're progressing. And then from goals, having a really clear plan how to reach those goals. So those three skills if you will fall nicely in line. Having a vision. Setting some goals. And then articulating a plan to achieve those goals. We also want to make sure that we're increasing our mindfulness, our awareness of how our own mind works, because that's at the center of developing confidence. Using our own dialogue and our own language to be able to cultivate an ideal mindset. Using breathing to be able to find a sense of calm and intensity in that moment. It's a powerful skill that oftentimes people are left wanting if they don't train it. So training it now is something that we're spending a lot of time with elite athletes to understand the value of breathing as well. Imagery and visualization. Being able to see within our own minds what's possible. To reinforce that over and over again. To actually change the mylanization of our nervous system to support well grooved neurological pathways in our brain and in our body. Using our mind to really create a pathway in our body. That's really powerful. Who knows where that's going to take us in our frontier, whether it's for neurological damages, whether it's from elite performance. It's a wide open spectrum and opportunity. Those are some of the skills that the greatest athletes in the world teach us that they are working on mastering themselves. And it's an opportunity for all of us to create space in our own daily living to be able to master these skills or work towards these mental skills so that we can explore our own potential.